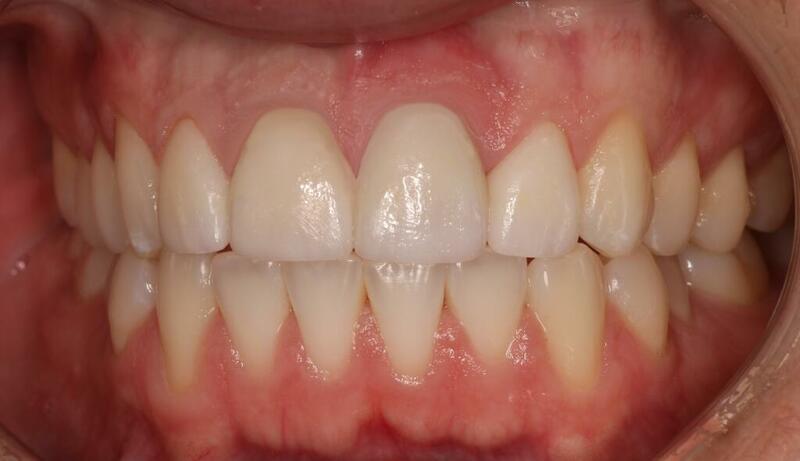 This patient came to us with three existing root canals as a youngster. Three of his upper four teeth were damaged in an accident when he was younger. After the three root canals were completed as a child, the teeth turned grey. This is normal with root canals because the tooth is basically dead from the removal of the nerve inside the root of each tooth. Bonding was placed when he was younger & now that he is grown & his face has matured, the patient is ready for a more permanent, natural procedure for his smile. 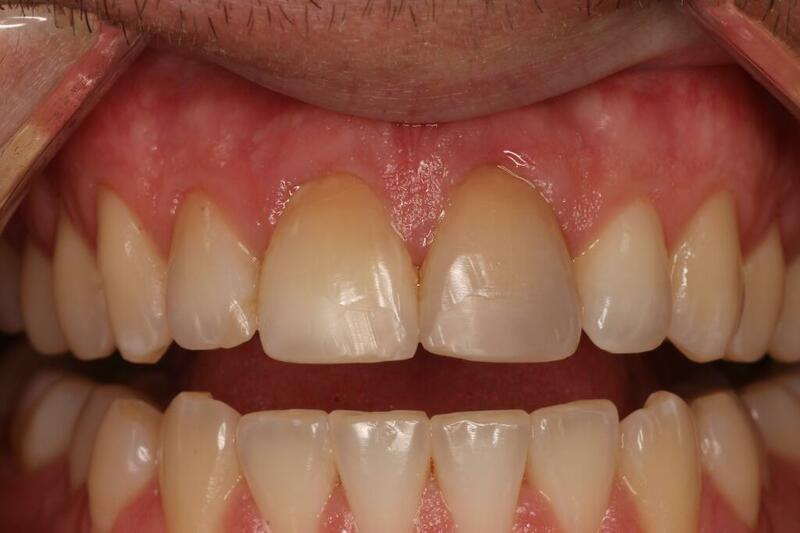 Dr. Friedman placed three upper full coverage porcelain crowns with his unique “blocking out method” to block the grey tone of the patient’s root canal teeth & one porcelain veneer giving this patient a natural smile all while saving his natural teeth in the process. This is the most difficult for cosmetic dentists using the latest in porcelain restoration materials because the best porcelain materials are translucent. Without Dr. Friedman’s “blocking out method” the dark tone of the root canal teeth would show through usually not matching the veneer tooth to which the root is much lighter in shade because of no root canal. 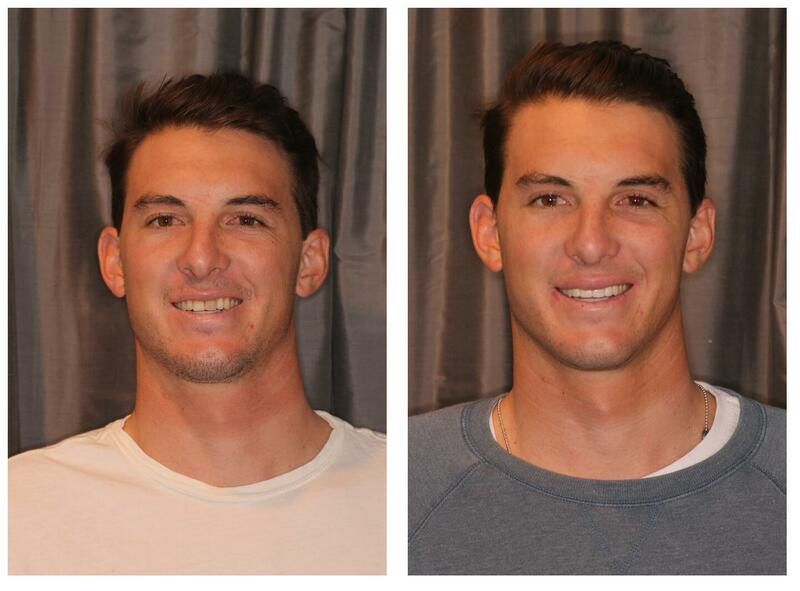 As you can see, this “blocking out method” worked beautifully and his upper four teeth match the rest of his smile that we whitened before the porcelain was placed with our in-office, Zoom teeth whitening procedure. ~Fact 1) Dr. Friedman is able to change your smile shape, tooth color, smile width, & straighten teeth in as little as two visits with porcelain restorations. Bonus: The porcelain restorations Dr. Friedman uses will never, change color, shape or size, no matter how much RED Wine you drink…..EVER! ~Fact 4) Dr. Friedman is so confident in his technology, materials, & skilled workmanship, MOD Squad Dental offers a warranty to all their patients after treatment. Bonus: Think this one speaks for itself! If you are interested in any general, cosmetic, orthodontic, or restorative dental procedures, including dental implants, call Jess today to reserve your complimentary consultation 858-547-0070.